Sourcing classic rosé varietals from blocks that were specifically planted and grown for Rosé, this vintage is done in a dry, Southern French style. The blend is approximately 48% Grenache, 42% Syrah, 9% Mourvedre, and 1% Counoise. A bright citrus skin note balances the full fruit flavor. The finish is crisp and refreshing. Our first release of a long held dream, to produce a Methode Champenoise Rosé. In our family, we all love sparkling rosé. It feels both decadent and whimsical to enjoy a glass of pink 'bubbles' before dinner and on special occassions. We started with early picked Cabernet Franc from Eevee's Vineyard, fermented it dry, and then restarted fermentation and bottled after aging in neutral French oak for 9 months. Disgorging and dosage occurred in July. We used a very simple dosage of slightly sweetened Cabernet Franc rosé to balance the wine. The last couple of years we’ve made this for fun after having an abundance of Counoise intended for our GSM Rosé. It has been so successfull, we’ve been making it since. Some Syrah (20%) from the Serenade Vineyard was added to balance the bright acidity and stabilize color. This is our fourth vintage of Grenache-specific rose, and the first that featured fruit from the Swallow Hill Vineyard in Ashland. As in previous years, this is our "middle" rose in the spectrum of sweetness, fruit and body. 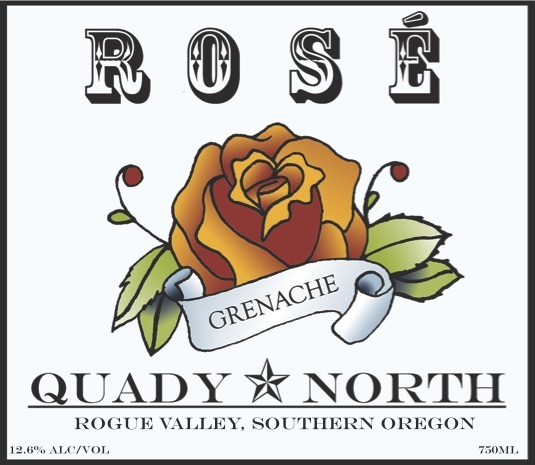 The fruit all comes from the Rogue Valley, 56% from Swallow Hill, 20% from Serenade, 20% from Buxton and 4% from Aardvark. Rosé all day.